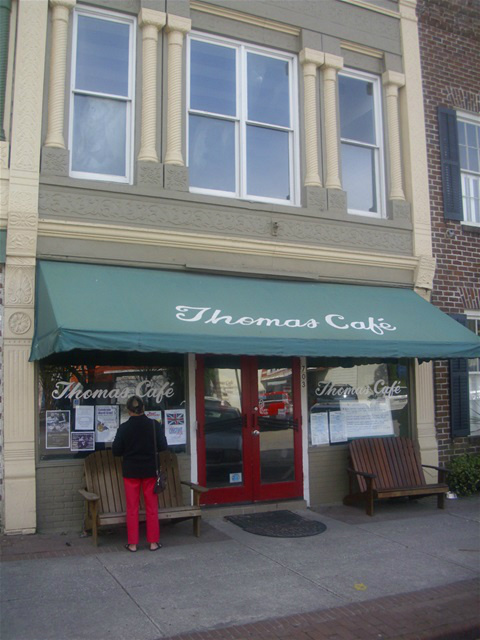 Thomas’ Café, noted to be the oldest eatery in Georgetown, dates back to the early 1900’s. The old-fashioned diner sits near the clock tower on Front Street in the historical district and currently is owned by Earnest Brunson. While Beth Waniner was out on sick leave, Ashley Crawford and Kelly Crosby, two more of the café’s staff members, and I were talking about how old it was. I remember when the previous owner had hung a picture on the wall that read, “Est 1902.” However, Kelly said she had spoken with Mr. Thomas (the original owner’s son) awhile back and he said the restaurant had been established in the 1920’s. “I noticed the gumbo and the jambalaya are not there anymore,” I stated as I wrote some notes. “That’s because Earnest would make up a big batch of it and then have to throw most of it out at the end of the day,” Ashley explained. “What is the bestselling thing on the menu?” I asked. Ashely and Kelly offered a laugh and then both denied, “No, it’s not haunted. There are no ghosts here that we’re aware of and Beth and I have been here seven years,” said Kelly. I wrote some more notes and then asked, “So nothing exciting ever happens here? What about the lawyer’s table?” I was referring to the back table. All of the locals know, in the morning time, that is where all the lawyers and judges sit. As we brought an end to our meeting, I asked about Beth who had some surgery done. I was told she would be back (the following week) hopping around. “She’s going crazy sitting at home,” Ashely said of her co-worker’s convalescent period. While I sit and write about one of my favorite eateries, I think about many of the locals who come here for breakfast and lunch; Phil Brady, Penny Thomas Barbour, Eliza Hilliard and let’s not forget myself. This is truly a place taken out of time. I would say Thomas’ Café is one of the few places in Georgetown that maintains their nostalgia. Thomas’ Café is opened Monday through Saturday. They open at 7:00 am and close at 2:00 pm with the exception of Saturday. They close at 12:00 (noon) on Saturdays and serve only breakfast. Whether it is homemade southern-style cooking you want or you just want to stop in for a cold glass of sweet tea and visit the past, Thomas’ Café is the place to be.